A book on the history, relevance and implementation of the idea of a world parliament. 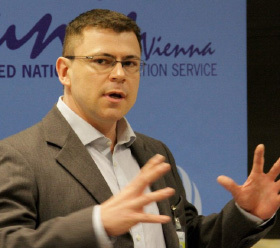 Andreas Bummel is known for his advocacy of a world parliament. He is co-founder and director of Democracy Without Borders and coordinator of the international Campaign for a UN Parliamentary Assembly. He frequently writes and speaks about global democracy. His book “A World Parliament: Governance and Democracy in the 21st Century” which was published in 2018 (with Jo Leinen) provides a comprehensive overview. Andreas Bummel is a member of the Congress of the World Federalist Movement-Institute for Global Policy in New York. Andreas was born in Cape Town, South Africa, in 1976 and moved with his family to a town close to Frankfurt am Main in West Germany at the age of six. As a child he was terrified by the possibility of all-out nuclear war between East and West that seemed all too real. The victory over apartheid in South Africa and the fall of the Berlin wall in 1989, left a deep emotional impression on him. Feeling as a global citizen and horrified by the inability of the United Nations to stop the genocides in Bosnia from 1992 on and in Rwanda in 1994, he became involved with the World Federalist Movement, WFM, an international non-governmental organization that was established in 1947 and which is devoted to strengthening of the global rule of law and democracy. One of WFM’s prime objectives was the creation of the International Criminal Court and since 1995 the organization has been running the international NGO coalition working on creating and strengthening the court. 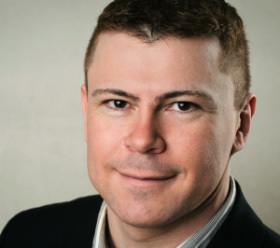 From 1998 on, Andreas has been serving on WFM’s council and since its abolishment in 2018 on the organization’s congress. In 1997, Andreas became involved with the Society for Threatened Peoples, STP, one of Germany’s largest human rights organizations. STP was one of the first groups that called for international action to stop the genocide and “ethnic cleansing” in Bosnia. The organization advocates the cause of minorities throughout the world. From 1998 until 2008 Andreas served as an advisor on UN issues and in 2009 he was a board member. In 2017 he was elected to the board again. In 2007, KDUN together with numerous partners around the world launched the international Campaign for a UN Parliamentary Assembly, CUNPA, that today has supporters in over 150 countries. As the Campaign’s coordinator, Andreas among other things organized the international meetings on a UN Parliamentary Assembly that were held in 2007 in Geneva, 2008 in Brussels, 2009 in New York, 2010 in Buenos Aires, and 2013 again in Brussels. From 2001 to 2006 Andreas worked as an analyst at the management consultancy firm FutureManagementGroup, FMG. Previously, he was trained in business administration and worked at the global pharmaceutical group Hoechst which today is part of the Sanofi-Aventis group. The department he worked at was responsible for the group’s quality management. Apart from his work and his other activities, Andreas enrolled in the Law School of the University of Mainz and specialized in international law and corporate law. In 2001 and 2002 he was a scholar of the Deutsche Studienstiftung which sponsors students of outstanding academic achievements. However, Andreas eventually abandoned university without graduation in order to concentrate on his political work. Since 2006, he is a full-time political activist devoted to the cause of global democracy and world federalism. In 2012, the World Academy of Art and Science, WAAS, elected Andreas as a fellow in recognition of his work on a world parliament and in 2015 the Society for Threatened Peoples awarded him the association’s honorary membership. He is a member of the advisory board of the World Government Research Network, WGRN, that was launched in 2015 and aims to advance the academic dialogue on global political integration. Under the leadership of Andreas KDUN was rebranded as Democracy Without Borders, DWB, in 2017. In addition to its advocacy of a world parliament, the organization is now committed to democracy promotion in general. 100 years ago, on 23 April 1919, Germany proposed a world parliament. Read Andreas’ comment. Andreas participated in the launch of Democracy Without Borders in Kenya on 4th March 2019. Here’s a report. Read Andreas’ policy review on a UN Parliamentary Assembly and the Inter-Parliamentary Union here. Here some reflections following the 22nd Forum 2000 conference on democracy in Prague. Here’s a contribution to a Roundtable on Nuclear Abolition organized by the Great Transition Initiative. In this guest article for CIVICUS’ Reimagining Democracy series, Andreas makes the case for a UN World Citizens’ Initiative. Read Andreas’ comment on the European Parliament’s support of a UN Parliamentary Assembly in this IPS report of 12 July 2018. Read a comment by Andreas Bummel on the first International Day of Parliamentarism on 30 June 2018 here. 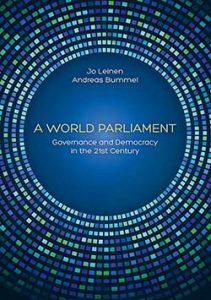 The semifinalist submission of Andreas Bummel to the New Shape Prize titled “A Renewed World Organization for the 21st Century” is made available by Democracy Without Borders here. 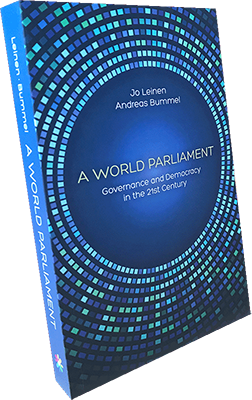 The new book “A World Parliament” by Andreas Bummel and Jo Leinen was recommended, among others, in Global Policy Journal, by Peter Singer, and Kumi Naidoo. It was presented in New York, Brussels and Berlin.